1. What issues do you see in your local riding that need to be resolved? Better representation and more jobs. The people generally feel like we are always left out while the government remains focused on Calgary and Edmonton and that is unfair to the people. There has also been a steady decline of good available jobs and the people are left trying to make due. 2. What will you do — if elected — to attract not only jobs, but good, family-raising jobs to the riding? The key will be to remove the red tape and restrictions around small and medium-sized businesses, which account for 70% of the province’s employment. Less taxation and interference will allow business growth and the creation of more long term and stable jobs. 3. How will your party balance taxation with quality service delivery (i.e. 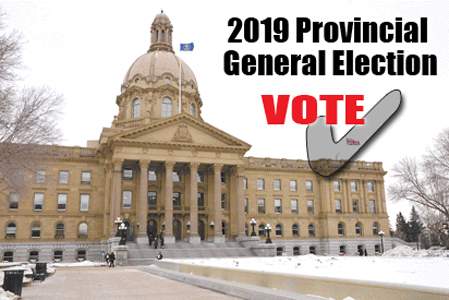 education/health care/infrastructure) in Alberta? Services like education and health care cannot be cut or frozen. They are far too important. But there are a lot of inefficiencies that can be assessed and repaired to make essential services more cost effective and not cause a massive hike in taxes. 4. Identify your two priorities that you / your party will help diversify the economy to lighten the boom and bust cycles of the oil/gas industry? One priority for diversification stays in oil as the Alberta Party is focused on refineries, creating a higher priced and more sought after product, as well as more long-term jobs. We also plan to invest into a severely under staffed forestry industry and help that industry become a large provider for the province. 5. What specific steps will you undertake to address the province’s current deficit? As the only party to release a shadow budget in the last four years, we had projections to get rid of the debt around 2021/2022 through responsible spending and allocation of funds. There is no glamorous plan to being practical and fiscally responsible. We have to be more responsible with what we have. 6. What strategies will your party use to make forward progress on pipeline issues affecting the province? Better consultation with affected jurisdictions. We can’t throw a temper tantrum when BC (for example) says no. We need to consult the environmental groups and the indigenous peoples whose land will be affected, and be willing to make a few concessions. We need to be able to come up with a solution that works for everyone, not just Alberta. Playing “hard ball” is not the key. We need to work together. The number one issue that I hear from voters, in the Taber Warner riding, is to get rid of the Carbon Tax. If we are privileged to form government, this will be our first bill (The Carbon Tax Repeal Act Bill). In the rural parts of the riding, our farmers and ranchers want to see Bill 6 (Enhanced Protection for Farm and Ranch Workers Act) repealed. We will repeal this bill as well and then do proper consultation with our farmers and ranchers. There has been a lot of concern raised about property rights over the years. We will propose an amendment to the Constitution to enshrine property rights in Alberta. We have a lot more we plan to do on this issue which you can see on our website. Eliminating the Carbon Tax will add millions of dollars back into our job creators so that they can do what they do best… create jobs. Local businesses will also benefit from a lower corporate tax rate. Dropping the corporate tax rate from 12 to eight per cent will be a significant incentive to build and increase business in our riding. Albertans expect that their government be efficient and effective with their tax dollars. Alberta already has some of the highest per student and per patient spending in Canada. The question is how effective are those tax dollars being spent? Student testing scores are down, especially in math. Healthcare wait times are still excessive and out of line with other provinces. A United Conservative government will guarantee that surgical wait times will be no longer than four months. We have based our model on the successful plan introduced by Brad Wall in Saskatchewan, where they not only reduced wait times, but also reduced cost of healthcare delivery by 27 per cent. A United Conservative government will focus on eliminating waste in middle-management and ensuring that tax dollars are being spent on effective and efficient programs. The savings we find will be re-invested into our front-line service providers. One, reduce the tax burden on local job creators. Almost $100 billion of foreign investment has been lost over the last four years. Alberta will reduce the red tape and regulation by one third. The Alberta Advantage, of low taxation and a low regulatory environment, helped diversify the economy in the late 90s. Reliance on the oil/gas industry dropped from 37 per cent to 24 per cent during the late 90s and early 2000s. Unfortunately, that reliance on the oil and gas sector, under this NDP government, has risen to 37 per cent again. We will get back to the winning formula of the Alberta Advantage that created good paying jobs for not only Albertans, but hundreds of thousands of individuals that moved to Alberta. Through attrition, the United Conservative party will decrease the size of middle-management in the government. Getting out of the way of our job creators will help our economy to grow by 3% per year and this will close the fiscal gap in our budget. The United Conservatives have created an aggressive plan to counter the negative forces that swirl around Alberta energy production. Alberta can be proud of its energy sector. It is the most ethically and environmentally conscious energy production in the world. While Premier Notley has seen fit to apologize for Alberta’s energy sector, calling us an embarrassment, the United Conservative government will be an unabashed promoter of our industry. A United Conservative government will use every political, legal, and economic tool to see that pipelines are built and the energy sector has every opportunity to grow. If politics hadn’t featured so prominently on the pipeline issues, the energy boom would have happened in Alberta as it has in Texas and the Dakotas. Rural sustainability is a huge issue that needs to be addressed. Included under that “umbrella” would be job creation and economic diversity, while at the same time not sacrificing our accessibility to first class educational opportunities, healthcare and human services. We must pursue the diversity of our local economy by playing to our strengths as an agricultural and oil and gas community. Let’s explore the plant protein industry and become more involved in the Pan-Prairie Food Cluster. We can look at secondary production for our petroleum and gas products, all here in our backyard. Investment in economic diversity naturally creates more jobs and prospects. We must address the need for affordable housing in our communities to allow for more growth. We must ensure that our seniors can stay in the communities where they have raised their families and have friends in. We need to keep our communities viable so that our children and their children do not have to leave our towns and communities, that they find them safe and strong places to raise their own families. We must make our communities generational. As mentioned, we need to invest in diversity, play to our strengths. I remember a comment made by an overseas investor looking at Taber as a place to invest – you have a sugar factory, why are you not producing confectionaries? We must think outside the box. We have great transportation corridors, we have access to irrigation, wonderful soil, good weather, natural beauty, we have a dedicated workforce. We have an $11 billion tax advantage over the next lowest taxed jurisdiction, and Rachel Notley cut the small business tax by one-third. We both believe in supporting small businesses, especially local ones. When determining where to build a business – access to education and good healthcare are both significant factors. As is affordable housing for workers; providing welcoming and inclusive atmospheres within our communities that business owners would be happy to move their families to and grow their business interests. Rachel Notley’s government made a choice: they refused to make working people pay the price for the worst recession Alberta had seen in 40 years. Instead we invested in the things ordinary people rely on in better schools, better hospitals, better roads. There is a plan to balance the budget and we have been bringing the deficit down. Jason Kenney’s plan on the other hand would mean cutting $4.5 billion in corporate taxes for the richest corporations at the expense of the services like healthcare and education that our rural communities actually depend on. Since 2015, at the Coaldale Health Centre, we’ve built a new two-bay ambulance garage, we’ve invested in infrastructure renewal at both the Coaldale Health Centre and Bow Island Health Centre. We brought 50 new $25-a-day child care spaces in Taber. We’ve modernized schools in Taber, Warner, Barnwell and Stirling. We must continue to move forward in supporting our communities with quality service deliveries instead of cutting them as much as possible with a Kenney government. By building refineries right here in Alberta along with more upgraders for our petroleum products. More manufacturing of products such as hemp plastic, which can not only be locally grown, but more environmentally friendly. If re-elected, Notley government will double incentives for petrochemical and upgrading projects over the next decade, from the current $3.6 billion to $7 billion. This is expected to leverage $75 billion in value-added investment and create 70,000 jobs by 2030 based on the success of these programs to date. Jason Kenney likes to talk about all the jobs that have supposedly been lost under Rachel government instead of the many that have been created. Rachel has also invested in job re-training to help ease the impact of the boom and bust cycles of the oil/gas industry. Not through extensive cuts to our health, education and human services portfolios. We’re taking a measured approach through reasonable reductions in spending. We’ve cut salaries and eliminated bonuses for senior managers, extended a salary freeze for management workers in the public sector. We’ve cut the PCs’ out-of-control bonuses and perks like golf memberships for insiders and the first thing we did was get rid of the private jet fleet. We will continue to make very considered adjustments as we go with the aim of balancing the budget and making a significant reduction to the deficit within the next four years. Giving a $4.5 billion tax cut to the wealthiest corporations won’t help balance the budget – unless it’s on the backs of regular people, healthcare and education. Continuing to educate fellow Canadians as to the importance of getting Alberta oil to tidewater and overseas markets. What is good for Alberta is good for Canada. No one has fought harder for pipelines than Rachel. Pipeline construction delays are causing serious issues for our energy sector, but Rachel is fighting hard to protect jobs and diversify our energy sector for the future, and we will keep fighting for those goals. We have a duty to defend and increase the value of those resources. Albertans have known for a long time that we need to add more value to our energy resources, instead of shipping raw resources and the jobs that go with them to places like Louisiana and Texas. By diversifying our petrochemical and energy resources right here in Alberta, it will assist us in promoting the construction of our very needed pipelines. The export of Canola seed to China, getting the pipeline built. Extra infrastructure to help with roads, we have too many that are not paved and have not been taken care of in years, and to support our growing communities. Additional schools, smaller class sizes, additional education assistants for each class room. There will be a tax break for businesses, with additional infrastructure we can make building plants for more manufacturing companies to build businesses here. We will reduce your income tax and continue to support public services with a sustainable, pro-growth HST. Not all taxes are created equal. Some forms of taxation have a greater negative impact on the economy. A Harmonized Sales Tax (HST) is better for job creation, investment and growth, yet Alberta continues to overuse harmful income taxes. The Alberta Liberal plan will see a revenue neutral shift to an HST. We will reduce income taxes while introducing an HST. Albertans will not pay more taxes but the way we pay tax will change in a way that creates economic growth and reduces revenue volatility. Oil and Gas are critical to Alberta’s economy. We need to make sure our industry can compete for investment and get full market value for our product. We need to make sure we get the Trans Mountain Pipeline Expansion and other pipelines projects built. Yet, we can’t rely on Oil and Gas alone. The world is changing and we need to change with it. Alberta needs to grow other sectors like technology, agriculture, and our film industries. The best way to grow these industries is to invest in education and training to ensure Alberta has a highly qualified and flexible workforce. We need to create a pro-investment climate that encourages businesses to develop and grow. Alberta’s fiscal situation is unsustainable. Years of relying on volatile resource revenue have left us in a crunch after the oil crash. The Alberta Liberals have a plan to restructure our tax system. We will get off the royalty rollercoaster, address revenue issues and incentivize economic growth. Our fiscal strategy will protect services, grow the economy and will be fair to future generations. The critical National Energy Board environment review and Indigenous consultation and accommodation processes were botched by successive federal governments, and led to the Federal Court of Appeal striking down the approval on constitutional grounds. Alberta Liberal Leader David Khan is a constitutional law lawyer, he understands how Canada’s Constitution works and the right way to effectively consult and accommodate First Nations’ concerns. There is no shortcut to fulfilling the constitutional duty to consult. Declaring the project, already under federal jurisdiction, a “federal undertaking” will not change its status or get it built. There is no way to override Section 35 of the Constitution that recognizes and affirms Aboriginal and Treaty rights. First Nations must be properly consulted at the highest levels and their concerns meaningfully accommodated.